Booklet on tourism in the Cape Canaveral area including Cocoa, Cocoa Beach, Merritt Island, Eau Gallie, Melbourne, and Titusville. 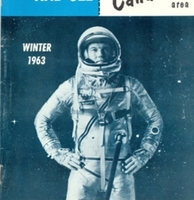 The cover shows Mercury Astronaut Leroy Gordon Cooper. The booklet is an aid for people vacationing or moving to the area. It details activities, restaurants, events, sports, television listings, schools, real estate information, and more. Original booklet, 1963: What To Do and See in the Cape Canaveral Area (Cocoa Beach, Florida: Brownell Associates, 1963): Private Collection of Thomas Cook. Digital reproduction of original booklet, 1963: What To Do and See in the Cape Canaveral Area (Cocoa Beach, Florida: Brownell Associates, 1963). Originally published by Brownell Associates. Copyright to this resource is held by W. P. Browenll, Jr. and is provided here by RICHES of Central Florida for educational purposes only. "The History of Cape Canaveral." Spaceline. http://www.spaceline.org/capehistory.html; Osborne, Ray. Cape Canaveral. Charleston, SC: Arcadia Pub, 2008. Osborne, Ray. Cape Canaveral. Charleston, SC: Arcadia Pub, 2008. "The History of Cape Canaveral"
Pan American, as prime contractor to the U. S. Air Force, has fulfilled the responsibility for planning, engineering, operating and maintaining Cape Canaveral and the Atlantic Missile Range since 1953. Pan American scientists and engineers have participated intimately in all stages of the national programs since early V-2 tests though Project Mercury's series of manned space flights. With Pan American, technically respected people have freedom to choose career positions with unlimited opportunities for professional development. In addition to normal company benefits, Pan Am offers the unique advantage of a 90% world-wide air-travel discount. You are invited to send your resume in confidence to David D. Bruner, Personnel Manager, Guided Missiles Range Division, Pan American World Airways, Inc., P. O. Box 4336, Patrick Air Force Base, Florida. Published four times yearly by Brownell Associates, 107 Beach Plaza Building, Cocoa Beach, Florida. Tel. SU 3-3176. Distributed free to all motels and hotels in the area. Advertising rates on request. Published with the approval of the Gallie and South Brevard Beaches Cham-Cocoa, Cocoa Beach, Titusville, Eauber of Commerces. Staff: W. P. Brownell, Jr., E. A. Brownell, Harry Brackett, James Smith, Craig McCauley, W. P. Brownell, Brennan Ryland, Betty Woolfe. Copyright 1963, W. P. Brownell Jr. Reproduction without written consent prohibited. Project Mercury Astronaut Leroy Cooper. NASA Photograph. “What To Do and See in the Cape Canaveral Area.” RICHES of Central Florida accessed April 24, 2019, https://richesmi.cah.ucf.edu/omeka/items/show/1027.